A wardrobe plan elevation, describing a kitchen's layout to help designers improve the way kitchen uses its available space. Edraw wardrobe plan software and examples help designers improve the way wardrobe uses its available space in a drawing according to their actual physical size. It includes thousands of predefined elevation symbols to visualize how many items a cabinet can contain without CAD skill requirement. Learn basic wardrobe planning tips here. You may check out your perfect wardrobe designer here. 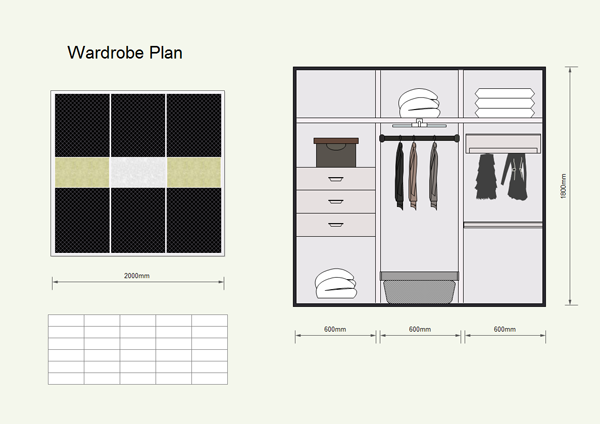 The above wardrobe plan example is drawn with the Edraw Max software.